A photograph alone is not sufficient to prove that the things or event in the photo is real. The reality of the things or event needs to be determined using inductive reasoning, where multiple information is considered and evaluated together. Flat-Earthers often claim that we regard certain things or events as real only from photographic evidence. In reality, there is information other than the photographs themselves that was considered and led us to accept the things or events are real beyond any reasonable doubt. Inductive reasoning is a method of reasoning in which the premises are viewed as supplying some evidence for the truth of the conclusion. The truth of the conclusion of an inductive argument may be probable, based on the evidence given. We all do inductive reasoning every day. If the amount and strength of the evidence are sufficient, we can reasonably call the conclusion as the truth. A photograph can be regarded as evidence in favor of the things or events depicted in the picture. However, making the conclusion from the photograph alone is the fallacy of defective induction. To correctly conclude, we need to have more information. Who took the photo? What are his credentials? Were there eyewitnesses? Is there evidence other than the photograph? These are valid questions where the answers can give us evidence in favor or against the conclusion. The photographs from the Apollo Moon landings are corroborated with testimonials from thousands of workers, schematics, blueprints, source codes, as well as multiple confirmations from independent third parties, including from rivals and enemies. We can be sure beyond any reasonable doubt that the Moon landings did happen. 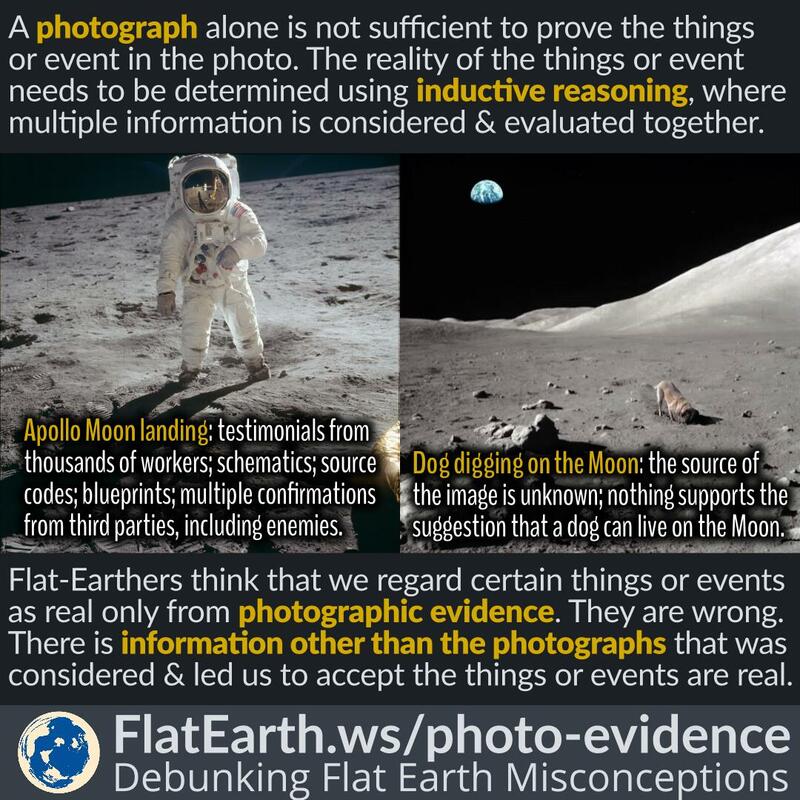 On the other hand, something like a meme showing a dog digging on the surface of the Moon is from an unknown source, and nothing else supports the suggestion that a dog can live on the Moon. We can be sure beyond any reasonable doubt that the picture is not real.